Who’s Afraid of The Big Bad……Big Bird??? I’ve been doing a lot of soul searching recently, stripping away layers to find out who I am at the core. Turns out, I like to get my freak on, baby! Wiggle, wiggle, wiggle..Yeah…Umm, OK. You got me. Getting my freak on consists of being a neat freak, reading and writing for hours on end and bed at 10:00. It must be noted, I have been known to eat raw cookie dough and forgo making the bed. Wild women do, and they don’t regret it. I’m losing the plot here though. When I laid my soul bare, I found that fear has been the great motivator most of my life. As a child I was always anxious, scared of the dark, monsters under my bed, people. I was painfully shy. I was afraid of getting lost or being abandoned. It didn’t help that I was sick a lot and had childhood epilepsy. Long story, but I was born premature, and in addition to causing damage to my optic nerve, it also affected another part of my brain. I was lucky I grew out of the seizures but my eyes are still a hot mess. 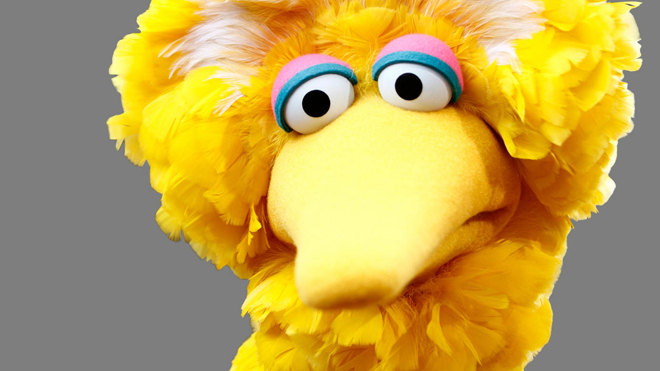 In addition to all that nonsense, I also had an irrational fear of Big Bird. Yes, THE Big Bird from Sesame Street. His yellow feathers sparked terror in my young heart. It should be noted I was weird. The more things change. As an adult, I figured boys out (sort of) but the fear of rejection and failure are still alive in me. I’ve learn to fake being out going. I push myself daily to live outside my comfort zone. However, the hills are still alive with the sounds of that anxious, shy, scared little girl.) Nowadays, I find myself wondering why I have such extreme highs and lows. Life is wonderful. Life is horrible. This narrative is on an endless repeat like a bad mix of an Adele song. By the way, how dare anyone mix an Adele song! THE NERVE! The wonderful thing about reflecting and looking at one’s soul is it leads to awareness. I’ve finally discovered the root of my neurotics. My moods are tied to outside forces. If I received praise that day, or if I felt slighted, if the scales were kind to me that morning or if they screamed (lay off the chocolate, woman) etc. I finally get it! I’ve been tying my worth to things and other people. I’ve been so consumed with the exterior; with wanting to be liked, wanting to fit in that I forgot to take inventory of the internal. Guess what? The fear is coming from me; turns out I have had the power to dissolve it all along. All I had to do is find its source, acknowledge it, and kick in the teeth. So what if my charm eludes some people? So what if the scales go up a few pounds? So what if I don’t fit some preconceived mold? My happiness, your happiness comes from within. We define who we are. No one else! The external will always be chaotic and unstable. People will come and go. Those things are out of our control. What we can control is ourselves and our reactions to life’s lunacy and A-holes. The amazing thing is once we find peace with our inner being, the less shaky the exterior becomes. We have to let go of that which we cannot control. Another secret I’m learning is the past and future are way overrated. The here, the now, this moment is what should really rock our socks off. When we focus on the present and what it can bring, fear becomes less and joy becomes more. I’m learning to kick that tired, worn narrative of I love my life. I hate my life to the proverbial curb. I think so too. It’s still a work in progress for me, but I won’t stop striving.